This hut is tucked into the bush edge on the eastern shore of the lake. It was built in 1982 to replace the old hut which was on the shoreline a couple of hundred metres to the south. L Poteriteri is in southern Fiordland & drained by the Waitutu River to Foveaux Strait. 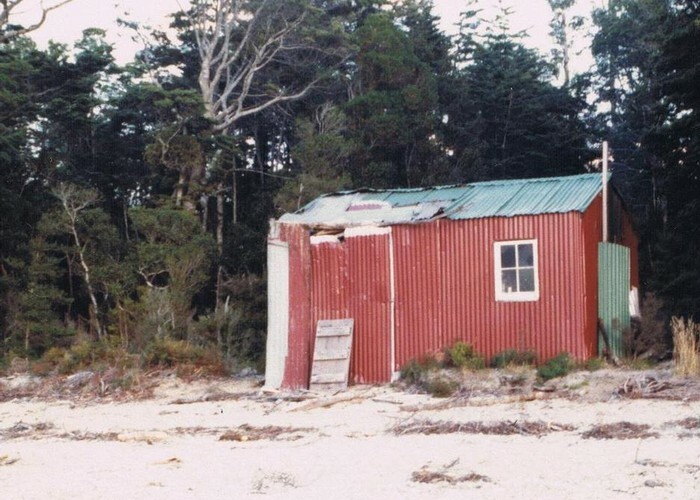 "Old" Lake Poteriteri hut (Removed) 1982 • By glennj. Licence: C.
You can walk from Lake Hauroko or the South Coast. The last part of these routes used to be untracked so competency in untracked bush country walking is required. I'm uncertain if float planes or helicopters are allowed into this part of the park these days? Added 13 August 2010 by glennjglennj. No revisions.